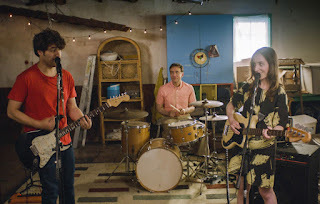 The couple at the center of writer/director Zoe Lister-Jones’ Band Aid spends the duration of the movie evading their problems with each other, and when that doesn’t seem to be working, they devise a way to retreat further inward into a newer, supposedly cleverer way of evading those problems. This is a troubling and dishonest romantic drama about two souls, each alike in his or her distrust and dishonesty toward the other, and Lister-Jones’ screenplay never manages to reconcile the supposed honesty in such a view with the melodramatic methods of driving one wedge after another into the gap that divides this romance. That means that whatever reconciliation between the characters that might occur feels dishonest, as well. The premise finds the two counterparts in the relationship creating a band out of their frustration with each other and turning what could be healthy arguments into songs. At this point, one must pause to remember that the institution of an artistic treatment of such a thing downplays its seriousness, hence the evasion of a genuine confrontation. It’s a mutual decision, too, so the problem splits into two separate sub-problems. The first problem is that we recognize that, when Anna (Lister-Jones), a driver with a popular taxi service, and Ben (Adam Pally), a graphic designer in the dead-end existence of being commissioned for corporate logos, decide to confront their problems with song after discovering some marginal musical talent, we wish that they would stop singing for a minute to talk it out. The material involving their independently produced band, The Dirty Dishes (so named for the household chore that, they believe, represents much about their relationship, though we aren’t so sure), is distracted by the hiring of an oddball drummer (played by Fred Armisen) whose entire subplot is unnecessary before it’s dropped without a resolution. The second problem arises when they do, indeed, stop to talk out their issues, and it’s a significant problem: These people need time apart to figure out who each of them is on his or her own terms. This truth rings true in multiple ways as the film confronts some of the louder melodrama of their shared past experiences, the first one regarding two professional failures and the second regarding a more obvious perceived “failure” that is the catalyst for some unfair aspersions cast on both sides of the argument by both parties. Of course, in these scenes, the concept of the musical routine is reintroduced, once more raising the question of genuine compatibility between these two. The performances are solid: As Anna, Lister-Jones has an innate and important ability to convey a lot of complex emotional terrain, especially in the second half, and as Ben, Pally is good in a largely reactive role. Together, the pair is less certain, asked to fight, then to reconcile, entering a pattern that grows weary and, later, tiresome as the stakes rise and the film finds its tidy resolution. Little about that resolution in Band Aid feels honest, and so solid performances only get one so far. It certainly isn’t very far here, in a movie whose supposed “honesty” is hiding some pretty ugly truths designed to manipulate.